Over the past year, Qualcomm has added a dose of glamor to chipsets, with many of our commenters regularly lambasting manufacturers for not choosing Snapdragon for their products. Those arguments look set to become even more regular, now Qualcomm's confirmed quad-core Snapdragons are on their way, for at least 12x the added performance of what's most likely in your smartphone now. The one to keep an eye out for when scouring specs sheets is the AP8064, which is based on Qualcomm's Krait 28nm code. It can pump out 2.5GHz for each core, and is specially designed for the swathes of ultra-thin devices we're seeing more of now. Plus, it can support larger resolutions, HD gaming and even 3D capture and playback. 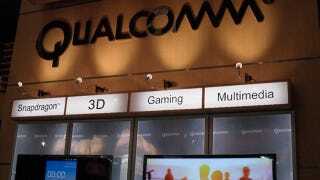 Full details are down below in Qualcomm's press release. BARCELONA, Spain, Feb. 14, 2011 /PRNewswire-FirstCall/ — Qualcomm Incorporated (Nasdaq: QCOM) today announced its quad-core Snapdragon™ chipset designed to meet the requirements of next generation tablets and computing devices. The new quad-core APQ8064™ is the flagship chipset in the new family of Snapdragon chipsets and is based on the new micro-architecture code named "Krait." With the purpose of being built for mobile devices, this 28nm micro-architecture will redefine performance, achieving speeds of up to 2.5GHz per core and minimizing power consumption and heat generation to enable new, thin and light form factors. The Snapdragon APQ8064 chip will be designed to enable the next generation of converged computing and entertainment devices. These devices will have significantly higher performance requirements, including support for larger screen sizes and resolutions, more complex operating systems, multi-tasking, multi-channel audio, HD gaming and stereoscopic 3D (S3D) photo and video capture and playback, as well as output in full HD to 1080P flat panel displays over HDMI. While performance requirements have been increasing, battery technology and capacity have struggled to develop at the same pace. To meet this challenge, Qualcomm created its next generation architecture and integrated four new, low-power CPU cores and its advanced Adreno® graphics into the APQ8064, enabling it to offer twelve times the available performance as well as 75 percent lower power than the first generation of Snapdragon processors. The combination of advanced processors and multimedia technology will provide tablets and mobile computing devices with unsurpassed performance, battery life, low thermal dissipation and the broadest set of connectivity options available in the industry. "We're excited about the new, innovative devices the APQ8064 will enable in the market," said Luis Pineda, senior vice president of computing and consumer products at Qualcomm. "With its WiFi integration and ability to seamlessly interface with Qualcomm's 3G and LTE modules, the APQ8064 will provide OEM's with a flexible, cost efficient and fast time to market platform that can meet all of their design configuration needs for tablets and next generation computing and consumer electronic devices." The APQ8064 processor will include the Adreno 320 quad-core GPU, which will deliver fifteen times greater performance than the original Adreno GPU, for a console-quality gaming experience, as well as rendering rich UI's. With up to 20 Megapixel camera support, the APQ8064 will internally synchronize two camera sensors for 3D video recording and will support external 3D video playback. The APQ8064 will feature a variety of features that make it the most compelling processing solution for use in mobile entertainment and computing devices, including support for both PCDDR3 and LPDDR2 memory, serial and PCIe interfaces and multiple USB ports. As part of the next generation Snapdragon family, the APQ8064 will share a core set of features, including a quad-combo of connectivity solutions (i.e. WLAN, GPS, BT and FM), support for NFC and stereoscopic 3D (S3D) video and photo capture and playback. The APQ8064 also will support all available major operating systems and be software compatible across the chipset family. BARCELONA, Spain, Feb. 14, 2011 /PRNewswire-FirstCall/ — Qualcomm Incorporated (Nasdaq: QCOM) today announced its next mobile processor architecture for the Snapdragon family. The new processor micro-architecture, code-named Krait, in the next-generation Snapdragon will redefine performance for the industry, offering speeds of up to 2.5GHz per core and delivering 150 percent higher overall performance, as well as 65 percent lower power than currently available ARM-based CPU cores. These chipsets will be available in single-, dual- and quad-core versions and include a new Adreno® GPU series with up to four 3D cores, and integrated multi-mode LTE modem. The latest family of Snapdragon chipsets will include the single-core MSM8930™, the dual-core MSM8960™ and the quad-core APQ8064™. All chipsets in the family will integrate a quad-combo of connectivity solutions - WiFi, GPS, Bluetooth and FM - and include support for near field communication (NFC), as well as stereoscopic 3D (S3D) video and photo capture and playback. Support for every major operating system, across all tiers of products, comes standard on all Snapdragon chipsets. The software compatible chipset family will share the same 28nm technology and new, purpose-built CPUs and GPUs for the best mobile performance at the lowest power consumption. The latest Adreno GPUs will also be included in the family, allowing developers to continue to utilize high-performance Adreno graphics capabilities to drive spectacular gaming and user experiences across all device tiers. The Adreno GPU has the largest mobile graphics ecosystems with hundreds of games for Android, Windows Phone 7 Xbox gaming, and PlayStation Certified gaming. At the high end, the Adreno 320 quad-core GPU will deliver up to 15 times the performance of the original Adreno to drive the latest games and S3D video on larger-screen devices. Adreno 320 delivers similar graphics performance to today's latest game consoles, but for mobile devices. In addition, the chipset family will support 3D and S3D games, capture and playback of S3D photos and videos, and output in full HD to a 1080P flat panel display over HDMI. "Just as the original Snapdragon revolutionized smartphones with the first 1GHz processor, these new generations of Snapdragon will revolutionize the next wave of mobile entertainment and computing," said Steve Mollenkopf, executive vice president and group president for Qualcomm. "We believe we have an incredible lineup of chips and software, representing a single platform that OEMs can utilize to create new devices ranging from mass market smartphones with integrated LTE, to tablets, to next generation computing and entertainment devices." The single-core MSM8930 is the world's first single-chip solution with an integrated LTE modem designed to take LTE to mass market smartphones. It will include the new Adreno 305 GPU which delivers more than six times the performance of the original Adreno. The dual-core MSM8960 is the world's first dual-core solution with an integrated multi-mode 3G/LTE modem and was designed to meet the requirements of multi-tasking smartphones and tablets. It will include dual asynchronous CPU cores which can be independently controlled for maximum efficiency. The MSM8960 will also support dual-channel LP DDR memory and will feature the Adreno 225 GPU which delivers eight times the performance of the original Adreno. The quad-core APQ8064 will be designed to meet the performance requirements of the next generation of computing and entertainment devices while minimizing power consumption. As with the Snapdragon dual-core, the APQ8064 will include four asynchronous CPU cores which can be independently controlled for maximum efficiency. The Adreno 320 quad-core GPU debuts in the APQ8064 processor where it enables console-quality gaming and renders rich user interfaces. The APQ8064 will also include a variety of features that make it a compelling processing solution for use in mobile entertainment and computing devices, including support for both PC and LP DDR memory, serial and PCIe interfaces, and multiple USB ports. The APQ8064 will also seamlessly integrate with Qualcomm 3G and LTE MDM™ modems and modules, giving OEMs a flexible and cost-efficient platform that can meet all of their design configuration needs and help reduce time to market.